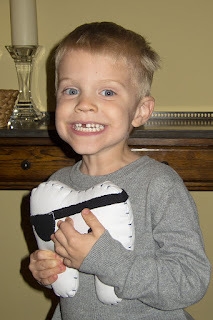 Little Man's tooth -- the one he cracked last spring -- was extracted. It had been slowly turning gray over the last few months, and recently he's complained that it hurt. So at the recommendation of our family dentist, I took Little Man to a pediatric specialist for an opinion. Much to my surprise, the dentist showed me how the front half of the tooth was freely wiggling and could come apart from the back half. Obviously it had to come out. I let Sweet Pea play in the toy area while I stayed with Little Man -- I didn't want him to be scared and think he was left alone during the procedure. 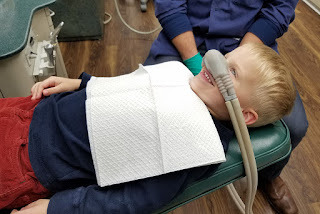 The dentist gave him laughing gas, then an injection in his gums (which was clearly uncomfortable), and then pulled the tooth out with pliers. Yikes. Little Man was crying hard, and they were holding him down. For the first time in a doctor's office, I was very uncomfortable with what was happening; I thought the anesthetic hadn't worked. Afterwards, the dentist explained that kids this age can't differentiate between pain and pressure, and Little Man was just feeling pressure. I wish he had told me that before the extraction. Anyway, the whole thing was done in about 10 minutes, and afterwards Little Man was fine. The halves of the tooth went straight into his tooth fairy pillow, and this morning he was thrilled with his two gold dollar coins. We went to Dollar Tree, and he picked out some ninja toys and a foam football. He looks so much older now! No, but I had the same thought when I first looked at this picture! He's just craning his neck weirdly. Don't worry -- he hasn't grown up overnight!